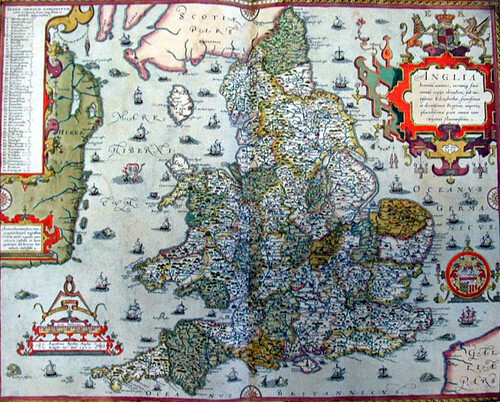 Originally published as a collection in 1579, this Tudor atlas of 35 coloured maps depicting the counties of England and Wales is a landmark in British cartography and printing. 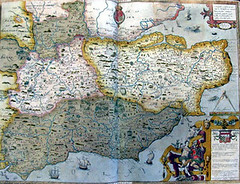 Christopher Saxton was responsible for producing the maps and his work provided a new standard of cartographic representation in Britain. 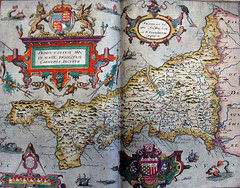 This atlas formed the basis for all succeeding county maps for over one hundred years. 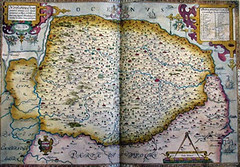 The map of Norfolk was the first to be completed and it bears the date 1574. 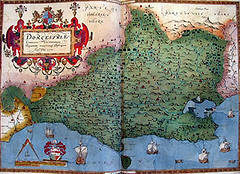 Possibly experimental, this is the only map in which the hundreds are designated by letters on the map, with a key to the letters and names of the areas in the top right hand corner. Other features, however, are common to the maps which were to follow. 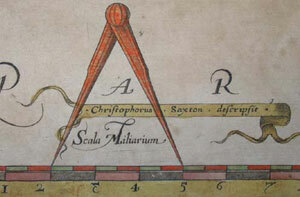 The title appears in Latin in an embellished cartouche in the top left corner. 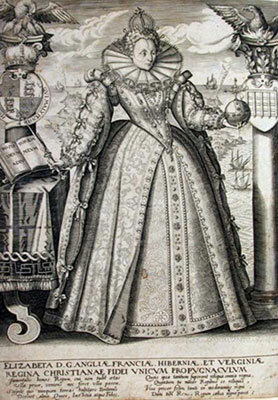 Other decorative features include the Elizabethan ships, fish and sea monsters inhabiting the sea. 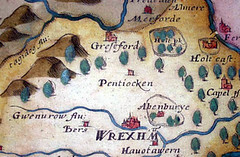 Although the map obviously had a functional use, these details were not irrelevant but were incorporated as an integral part of the map - the map was intended to be ornamental as well as practical. 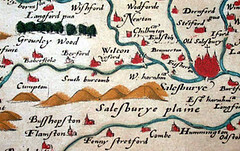 Saxton's authorship acknowledgement, with compasses and scale (detail from map of Monmouthshire) Saxton went on to produce a large wall map of England and Wales in 1583, and by the late 1580s he was established as a professional land surveyor. 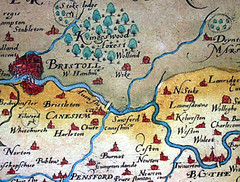 As the first man to survey England and Wales, his contribution to the development of cartography is unquestionable. The importance and influence of the atlas is demonstrated by the fact that the maps were re-issued and adapted continually until about 1778, almost two hundred years after their original appearance.